Cristiano Ronaldo is very used to breaking all kinds of goal scoring records, and it seems like he may break another one at some point this year. 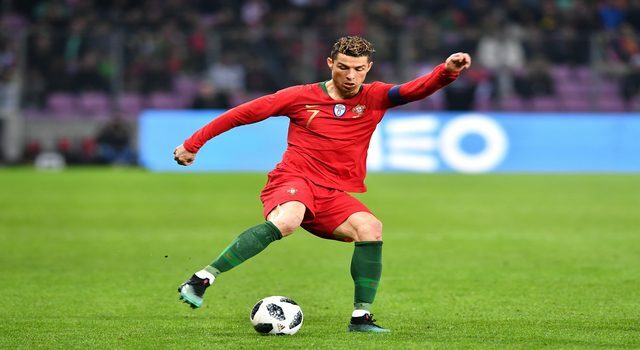 He has now scored 81 international goals for his country Portugal, which has taken him to within just 3 goals of the all-time European record. It is interesting to look at how Ronaldo has got these goals. 39 of the strikes have come in home matches in his native Portugal, 30 have come in away matches and 12 at major tournaments. His country have a very good record when he has scored as well, as in the 56 matches he has struck, Portugal have won 47, drawn 4 and lost 5. On the international stage, CR7 has scored 4 hat-tricks, 14 braces and a quadruple on one occasion. There are a few international sides that Ronaldo really enjoys playing against, scoring 5 times against Sweden, Armenia, Latvia and Andorra. Just below this are the 4 goals each against the Netherlands, the Faroe Islands and Estonia. The Portuguese superstar has scored against 34 different teams overall, but interestingly he has never grabbed a goal against France, Germany, Italy, England or Spain. He will have the chance to get his first against Spain in the group stages of the World Cup. After the international break, Ronaldo will return to club action with Real Madrid as Los Blancos travel to Las Palmas on Saturday.